When I was thinking of this post, I started with the subject. But before I started typing, I looked to my left and noticed I had a 2nd mailing that technically could qualify for the exact same post title, so I added the part 1. But when you get down to brass tacks, there is only a part two in the sense that the title applies. See - part 1 and part 2 are from two different mailers, so they are not joined together in the way one might normally think of when presented with two parts. It's like the final Hunger Games movies, Mockingjay Part 1 and 2. They were the last book split into two movies - continuation from the first movie to the second. However, my part 2 is not a continuation per se, but a sense of similarity. Does any of that make sense? And while you ponder that, does "when you get down to brass tacks" make sense? I just typed that as it came off the top of my head, and what in the hell does that really mean? Google searches seem split on where it came from, though they have a general sense it derived from the mid 19th century. It either refers to hardware counter top or upholstery and deals with measurement. Or the idiom could just exist because it plays well with rhyming and.....wait, what the hell was I talking about? Have a seat and try to remember. Oh yeah - cards. Ultimately, every post is about cards, right? Around all the blogs I read, I've been seeing mailing posted of cards sent by Tony from Off Hiatus Baseball. I'm joining that group as Tony dropped a nice smattering of cardboard on me a couple weeks back. Each mailing appeared to be a copy of the next, but perfectly suited for the team collection of the recipient. Which means I got White Sox. Yup! Lots of wonderful, glorious White Sox. I got all the cards from the return of Donruss in 2014, but I never got any of the inserts, so a Sale Diamond King made for a fine addition to the Sox box. As does a black bordered '09 OPC Anderson. 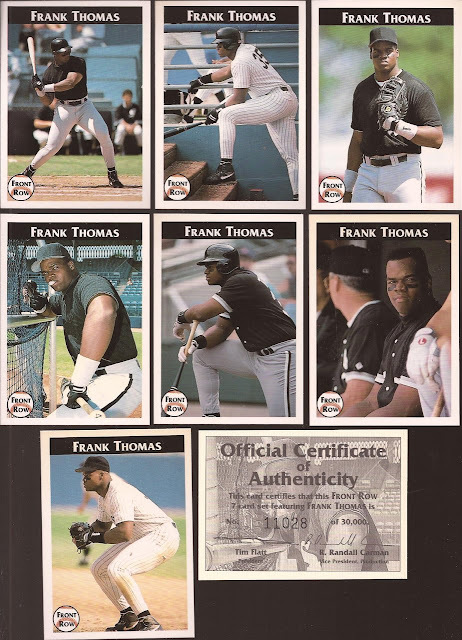 I wonder where Tony got all the Drake's Big Hitters cards, since I have been seeing a load of them in the other posts. I am just glad that the Bull was part of the group. Before Tony's mailing, I had 3 cards from this Frank Thomas Front Row set. Tony included the entire thing, along with a certificate. Now I feel official. Even if the cards are pre Panini clones with no logos anywhere to be found. Oddballs. 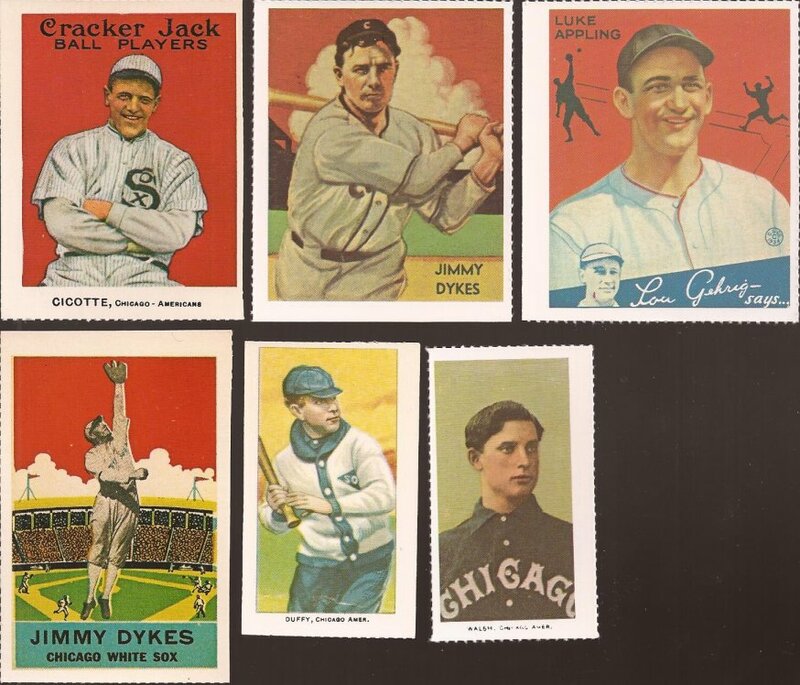 Got a little of everything here with these reprints, from Cracker Jack to Goudey and Delong. I own an actual Goudey (not Appling), T206 (not Walsh) and Diamond Stars (not Dykes). Someday I add a real Cracker Jack and Delong Gum. Goals, kids. Remember to set goals. So thanks Tony for the #Supertraders mailing. I have started my own mailings to the group, but still working on filler for yours. Pretty soon my mailings will be everywhere. Tony's packages are awesome. I'm off to track down one of those Thomas sets for my binder. Unfortunately... I'll be doing it with that song stuck in my head. Tony must have bought out Front Row's remaining stock. Yep, gonna need that Front Row set myself, plus a dupe of the Bubble Gum. 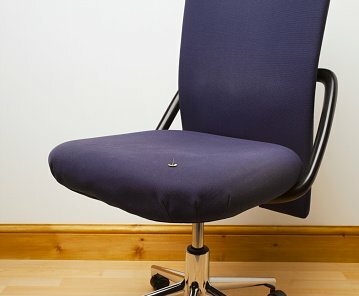 I'm personally drawn to the chair with tack...something for everyone here!